This jam is now over. It ran from 2017-05-31 22:00:00 to 2017-06-30 21:59:59. Create any kind of game inspired by the Angry Video Game Nerd! Whether you use the likeness of the nerd and friends, a parody of an episode or a remake of one of the crappy games he played is up to you. Use any game engine or scripting language you like. Swearing is allowed and applauded. Using copyrighted assets is on your own risk. 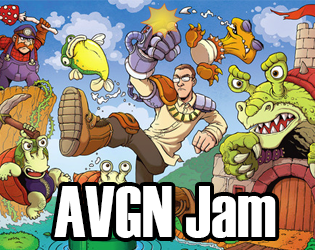 No assets from the AVGN Adventures game are allowed. Max. team size: 4 people and as many animals as you like.